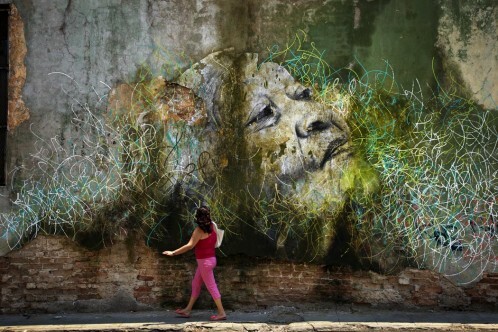 The Wrinkles of the City was started by JR in Cartagena, Spain and has been reprised in Shanghai, Los Angeles, and most recently, Havana. In 2012, JR and Parlá photographed and interviewed dozens of senior citizens who lived through the Cuban revolution, flyposting colossal black-and-white portraits of their subjects on the walls of city buildings. Parlá, who is of Cuban descent, interlaces the images with palimpsestic, calligraphic writings and color. In a city devoid of commercial imagery, JR and Parlá’s enormous yet intimate portraits offer a stunningly humane contrast to the endless repetition of political icons. Their current exhibition at Bryce Wolkowitz Gallery presents of twelve large portraits from the Havana iteration of The Wrinkles of the City project along with a site-specific installation. Since 2004, the French artist JR has traveled the world creating monumental portraits of ordinary citizens. He is widely considered one of the most influential and visionary of all street artists. José Parlá has received critical acclaim for his paintings, which lie at the boundary between abstract marking and calligraphy. 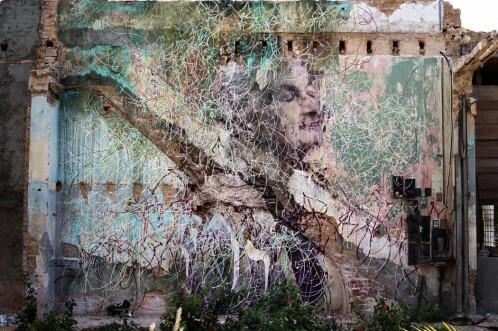 Composed from layers of paint, gestural drawing and found ephemera, his work evokes the histories of urban environments.